As a followup to the last post on great steak preparations, this is my second favorite way to have steak. My grandmother got this recipe from one of the steakhouse's in Fort Worth, Texas that she and my grandfather preferred and this is the method used at Ruth's Chris Steak House! I kid you not, it really is how Ruth's Chris prepares their steaks. The difference is we don't have commercial equipment in our kitchens, so forget the sizzling platter. However, the end result is the same and is wonderful. This is the way I prepare steaks when the weather prohibits outdoor grilling. Again, any cut may be used, but I still prefer Ribeye's and Mignon's for this method. 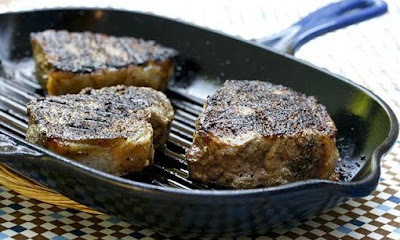 Place steaks in a cast iron pan or grilling pan. Sprinkle top side of the steaks with salt, pepper, garlic powder and onion powder. Then, place pats of butter all over top of each steak. This will add flavor and keep the steak from drying out. Broil on high until steak is browned well and cooked to your preference. Remove pan from oven and turn the steaks. Sprinkle the other side with salt, pepper, garlic powder, onion powder and cover with more pats of butter. Return to oven to broil until desired doneness is achieved. Plate and allow to rest for 5 minutes. Enjoy! This is my favorite way to do it, too. I love the way the butter carmalizes and the steaks stay tender. And the seasonings and butter bring out the natural flavor of the meat without overpowering it. Delicious!